Please be sure to go through all the slides below by using the button. Create Rich Text notes with pictures and links to other notes or web sites. Organize hundreds of notes in Tree Lists in many Notebook files. Highlight notes in the list by color or custom icons. Connect notes by links to review faster. Search for notes by text or by tags assigned to them. Copy, paste notes from one List to another. Print a book of notes. Want more details? See the Features page. Outlining helps you organize information into pieces and in a hierarchy. As a result, you can deal with complex information by breaking it into short notes in order to understand it. Have you tried outlining only in a word processor? Find out why a Two-pane List in WhizFolders software is a better device for outlining your thoughts, ideas and notes. Click to read this article. WhizFolders contains numerous features related to links. The links may go to other notes, web sites or can even launch external documents in their host applications. Click to read more about the use of WhizFolders as a Personal Wiki. Learning from the tutorials on the web or from PDF files? You can make effective notes, outlined in the sequence that makes more sense to you. You can also insert links to the original tutorial for reference as shown in the picture. See an example below that describes a session of making notes from a book. Also see a Demo on the Demos link at the top. You can better organize the collected text, pictures and links from web sites and books in the outlining list of WhizFolders. The feature "watch clipboard" can make your job easier by looking for incoming copies in the clipboard and pasting them as notes automatically. The List can also serve as a Thinking Aid. Click to read more. I also use WhizFolders as an Adwords Tool to manage complex information. Click to read a blog article. Realize the power you get when you combine an easy to use outlining list with a capable rich text editor. See the presentation at the end of the Demos page to get an idea of the kind of applications possible, as shown in the picture. Get WhizFolders, a list-based Outliner and Organizer for all your notes, ideas and writing projects. Think, write and learn better with this amazing tool! Write one short note at a time and you can manage big tasks easily. Outlining features that you won't find elsewhere. Take a look at the major distinguishing features of WhizFolders in a section below. Something like word-wrapped outline items sounds simple but is difficult to implement because each item in the list gets a different height. See the screenshot below for an example of such items in the left pane. Here is an example. I was making notes from a book on copy writing. I used WhizFolders to deepen my understanding of the subject by organizing the notes in my own hierarchy and sequence. It often happens when reading a book. The author's hierarchy and the order of the chapters may not match your own learning sequence depending on how much you already know about the subject. Organizing your notes in an outlining list helps a lot to understand the new subject because when you go to review your notes, you find them in the perfect order that you already have in your mind. What is the advantage of outlining in two panes here? As you can see above, the left pane contains the hierarchical outlining list showing the titles of the notes. I call these titles "outline items" in the features section. You may have your own term for it, for example, some people know them as headings. The right pane shows the rich text content of the selected note. The advantage here is that you get a better overview of your whole outline with less scrolling because you only see the titles in the outlining list. A word processor shows you the content too in the same list but that requires too much scrolling and takes too much time to load huge outlines. Also, unlike a word-processor outline, each outline level item can have text or note content in it. Please see the presentation later for a more detailed explanation of the advantage of this approach. Also, we do have a "View Combined Outline" feature as described later that helps sometimes to see everything in one list. Now please take a look at the outline in the left pane above. You can learn many aspects of how outlining helps from this example. The key points are explained below. I made the above notes many years back when reading a nice book on copy writing. When I found something worth noting, I made a new note in the outline and put it properly in the hierarchy. Note that I may not have followed the author's original hierarchy but made my own outline according to what I think fits where. As a result, I now have notes that I can review very quickly. Moreover, if I learn any new tricks that are related, I can insert them quickly in a proper place in the outline. Now let's take a look at this example from the reverse angle. If you were a writer, you could use this kind of outline to plan a new book on copy writing. You would be noting down thoughts and ideas on copy writing that come to your mind. But in this case, since the thoughts are random, you would be noting them down in different parts of the outline where they really belong. The end result would be quite like this but the sequence of creating the outline may not be same. WhizFolders gives you features to easily move outline items from one place to another by simple drag and drop or promote/demote buttons. In the end, when you think a book draft is ready, you can print the whole book with the outline automatically converted into a table of contents. Or, you can export the whole or part of the outline to an RTF file for refining in a word processor or for sending to an editor. Convenient tree list to manage and outline notes by their titles. See the presentation to know why a list is better for managing your notes as compared to a word processor or editor where too much scrolling is involved. You can insert pictures, tables and OLE objects, such as Excel Spreadsheets. What's the use? You can keep usage notes about the spreadsheet in the same note. Assign Tags (Keywords) to your notes and find them easily. Tags are used to assign relevant terms not present in the actual text of a note. If you accidentally changed or deleted a note, you can recover them from a "changed notes" database. You can find one or more notes easly by doing a boolean search for words with AND, OR, NEAR. Just select complete or partial list of notes and do a print or export to get a merged draft that you can use in your word processor for those final finishing touches. A copy, paste operation can also merge the selected notes, with or without headings, with or without level indents. A note is automatically pasted when you do a copy to clipboard in another application. There is no need to switch back and forth between the other application and WhizFolders. When you paste information from a web site, the location is automatically pasted for reference. This is a great way to quickly collect information from the Internet and later research it by using the links pasted with them. You can highlight specific notes in the list by changing their highlight color or by changing the icons. You can insert links that allow you to jump from note to related notes. Helps tremendously when reviewing and brainstorming the notes. You can insert links going to external files, folders and web sites. So you can use WhizFolders as a launchpad or bookmark manager with the added feature of keeping helpful notes about those links. Copy, paste works just the way you would want it to work. If you copy some notes and paste them in the same or another list, the child notes are automatically pasted. If you paste them in an external application like Microsoft Word, a merged copy is pasted. When dragging notes in the tree list from one position to another, precise drop marks appear to guide you as to where the dragged notes will be dropped. You can drag and drop multiple notes and even complete branches of notes. Alternatively, buttons are also there to move or change levels of the notes in the tree list. You can export the merged outline (a bunch of notes) in Word compatible RTF or outline format. This helps give fine finishing touches to your final draft in Word. You can turn your notes list into a simple, free format To Do List by showing Checkmarks on each note. See the presentation for an example. If you have only done outlining in an editor or word processor, this is different! Read more. In WhizFolders, you outline the titles of the notes in a powerful tree list with drag and drop features. If you have never outlined in a list before, you will love this aspect. See the presentation to know how this gives you the combined power of an outliner and an organizer. You don't have to horizontally scroll the outlining list to see complete note titles. Each title is word-wrapped. You can hoist part of an outline to concentrate on it. Other parts of the outline are hidden from you to avoid distraction. WhizFolders is primarily a two-pane outliner. But at times, you want to view the complete outline along with note contents, indented. Deluxe edition supports this feature. "I use it for my research and I can't imagine a writing program that is more efficient. It's the perfect tool for any multipotentialite who loves nothing more than to have a tool that organizes and connects the wide range of ideas and thoughts we have floating around in our head." "Whizfolders is superior to anything else I've used, and the addition of the notes organizer and the calendar makes it even better. I write weekly articles for our local paper and this keeps me more organized then ever before." "What I appreciate is your focus on notes. I'm so tired of programs that start out well-composed but then think that they must add more and more features to become 'multi-purpose' and end up clogging themselves with lots of junk that most users don't need or want. Notes are at the core of what most of us do, and a program that optimizes note-taking and management will always be of great value." "This is excellent software. I'm writing a book and I've tried EVERYTHING--... and at least three dozen other programs to help me organize my writing and this is the one program that does everything I wish the others did. You have really covered all the bases." "I use Whizfolders on a daily basis and frankly would be "lost" without it. Recently, with Vista, I was having the picture insertion problem and it has been aggraving me for months. After downloading and installing the new version and running the fix menu item - it worked like it used to on XP and I was so pleased! I hope you are planning on keeping that feature in future versions. Thanks for what you do and the art you paint in your masterpiece!" "I find Whizfolders a dream program - so versatile and quick - even with very large files." "You have an excellent product which is my default tool for documentation and I would not wish to give it up." "Your customer support is great and goes far beyond expectations." "I'm very happy with Whizfolders-- great piece of software!" "WhizFolders has become an essential tool in my practice and my teaching. As a lawyer, I use it for all kinds of legal research, outlining articles for publication, noting important judgements, structuring notes and outlines for complex drafts and more. As a lecturer, it is invaluable for organizing lectures and lecture notes. Its hyperlinking and web-research capabilities are without parallel." "I am very happy user of Whizfolders. It is the proprietary program which has become my information manager (having now discarded many others.)" "I love using Whizfolders, it's a perfect fit for so many of my activities. I access it everyday several times a day." "I've used and enjoyed WhizNotes for many years and WhizFolders is simply outstanding! You've added all the capabilities that I could have wished for." "I'm a reporter who uses WhizFolders to organize long stories." "I use WhizFolders all the time!" "Thank you for this great program!" Within minutes of using WhizFolders, you will get ideas on how you are going to use it for many different tasks. Its applications are only limited by your imagination. 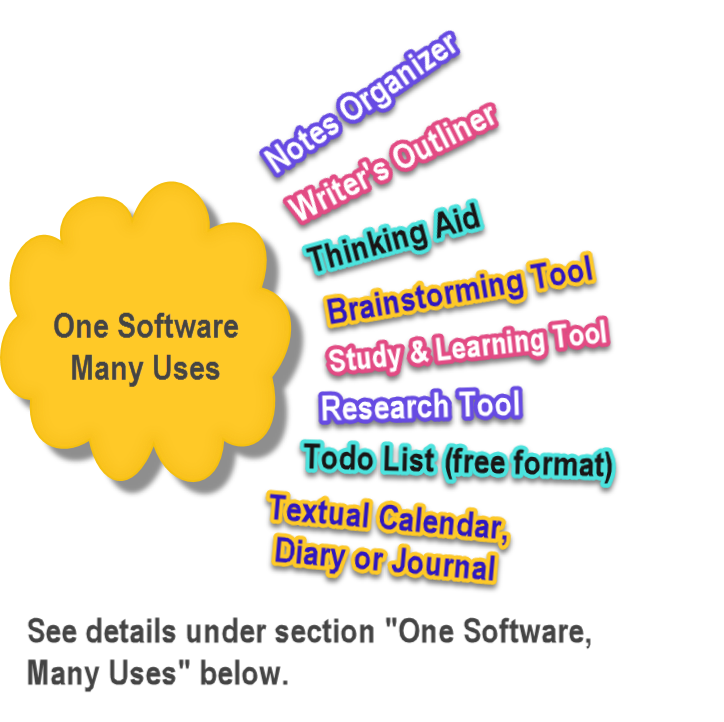 Here is an interesting Presentation on how you can use WhizFolders in many different ways--for writing, for learning, as a textual calendar, and a to do list. These are just the starting ideas. Once you get the hang of it, what you can do is only limited by your imagination. Have a question? Send a message to us. We reply fast, within 24 hours. Order through our FastSpring Secure Store and get instant delivery by download.